DO NOT - read ahead unless u have read the earlier parts of the story. The story so far in brief..
David, a newspaper reporter, had dared himself into breaking the myth of THE LEGEND OF KRISHNA. 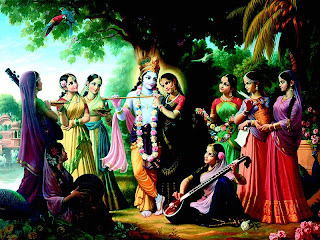 The legend had it that on chosen nights, Krishna - the handsome god, himself came down to the beautiful huge garden at the back of the temple in Vrindavan, India with his troupe of Gopis - his women followers and danced the night away. No one was allowed to see this spectacle. David had given the guards of the temple a slip and had managed to get inside the temple, eventually parking himself atop a tree to see if this was actually true. He had seen something..So far he had seen the women and was quite surprised but there was no Krishna yet...or so he had thought. He had heard the new woman say to everyone.."Vo aa rahe hain" (He's coming). The women had all gathered and were looking in the same direction. They knew someone was coming...The night had become absolutely silent yet again...this time it seemed unbearable. He knew..Whatever happened next..he was going to remember it for the rest of his life. He held on. Something had been bothering him rite from the very moment he had seen the women. He couldn't place his finger on it. But NOW he knew. The answer had suddenly taken him aback..it had made no sense..and yet..it was true. He was aghast. The answer had changed him into a believer in a flash..a mere instant. How could he see?? Was it him, was it the night or this pure magic that was slowly unfolding in front of his very eyes? It was lady night. She had slowly and gracefully transformed into a generous warm glow on the clearing where the women were, as if she herself was in anticipation of wot was about to happen. To David...this was not happening..this was illogical. It was beyond him. To even think of reporting this was insane. And then..he SAW....he saw a figure...far in the night...in the direction straight ahead. The women cheered. His eyes didn't blink..What he saw took his breath away.. He saw a figure...a young looking man....walking slowly in his direction escorted by the beauteous woman who had gone ahead to meet him. As he approached..David could see better.. The young man couldn't have been beyond 25 years of age and he was undoubtedly extremely HANDSOME..or..was he absolutely gorgeous? He couldn't decide. He was handsome in a way that if he ever felt like enacting the part of a woman in a play, he would still stand out looking the most gorgeous in a crowd of women. He saw that the young man was a shade darker than the brown skin....and he was dressed as a rich villager. As the man approached nearer, David could make out that he was dressed in a light golden dhoti wrapped around his waist in a neat wide bow...the bow end stretched longer than usual making it look perfect. Above the Dhoti, on his upper body, he wore nothing except a long flowing same color cloth that went from one of his sides all the way across his neck and coming back down to his other side, in one smooth flow. He had, on the area of his triceps, golden, thick bangles carved into beautiful designs... on both his hands. He wore a golden necklace and 2 different free size bead necklaces around his neck. He also had a huge white flower garland on him that apparently the woman had put on him when she had gone forward to greet him and he had lovingly accepted. The man wore a golden colored cloth on his head which seemed as if he had himself wrapped it and made it into a head gear. And upon that head-gear stood shining proud - a beautiful long and a multicolored Peacock feather. David's heart pounded loudly as he saw something else that made his eyes widen a bit more than it already was. As the divine entity walked onto the clearing..he saw that he clutched something long in his right hand. that had the power to attract all 3 creations when played - Earth, Heaven and Hell. Not only was the flute long..but beautifully carved as well and it looked as if it was made to belong to just one person - especially since it had a small peacock feather tied at it's end. The Man had never ceased smiling. It was heavenly. He had long lashes and his eyes were big and seemed to have in them the understanding of every emotion and vast wisdom. David knew who this was. HE KNEW. Instinct played no part in this recognition of his. It was obvious. He could be NO ONE ELSE. David's heart almost leaped out of his body as he whispered to his unbelieving self, "Oh my God..I'm looking at him. The God of Gods, the maker himself..right in front of my very own eyes - KRISHNA THE SUPREME !! Oh my GOD." The name 'Krishna' went across his lips, under his breath and David had become mesmerized from this moment on. Or....he was just imagining all this. He didn't know. He couldn't tell the real from the mesmerizing to the enchanting. He could see the clearing from his branch. The events of the enchanting night unfolded. 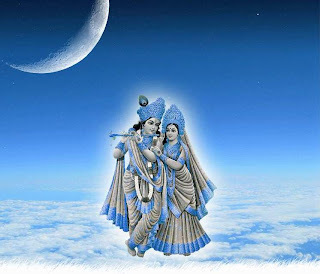 Krishna smiled and playfully ran lightly across the green grass, his flute in his hand and his peacock feather flowing graciously in the light breeze of the night...the women ran too following him as if trying to catch him and he took cuts and turns to avoid being caught. He eventually got caught and everybody laughed. 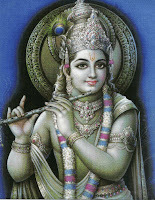 Krishna smiled at everyone and took his flute to his mouth. Krishna had not yet spoken a single word from him mouth. He smiled and stretched his hands looking at the beauteous woman to come to him. The woman lowered her head and shied away looking at a different direction. And then....it happened. David heard. David heard the Lord speak. Krishna had a playfully naughty smile on his face. He looked at the woman and said "Radhae, won't u come and dance with me?" It was as if the heavens had moved. His voice had an undeniable charm filled with emotions. David had heard the LORD speak. This was beyond description ! That stunningly beautiful woman was none other than 'Radha'. Krishna had called her 'Radhae' lovingly. The women teased them both. 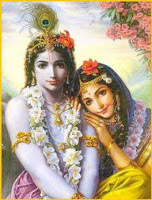 Radha slowly came to his side. Immediately after this, Krishna lifted his flute to his mouth and played it. The effect was enchanting. The tune was making magic happen. David couldn't believe at what he was witnessing. His eyes had almost come out of it's sockets. He saw every woman take her own place in the grass, they all stood in a circle at equal hand length. And Krishna BEGAN DUPLICATING himself. Suddenly there were 19 Krishnas. One each for every Gopika. All looked the same..all enchanting..all handsome..all smiled. But only one had the flute. The music had begun. Every Krishna held one Gopi's hand and the dance began. The heavens lit up. David watched. Each Gopi's Krishna danced. He had lost the real Krishna in the crowd of duplicates. Everyone was an original now. They danced in a circle..the motions flawless, the moves fabulous..mesmerizing. and just as suddenly....everything was gone..everybody had left..There was no Gopi..there was no Krishna..the clearing was just as lonely as it was when he had climbed that tree that evening. What had happened?? DId he lose time? DId he blink for a second? DId he doze off suddenly?? He didnt know..He swore to himself he had seen everyone dancing a mere second ago. No ..no no.. wait ..he DID see someone below...in the clearing. YES HE DID. The gopis were gone..Radha had left..but the enchanting light had remained..and KRISHNA had remained....was he seeing things?? He moved a bit. Yes he was right..he had moved a bit to his left, all that he could afford to rite now and confirmed from another position..that he wasn't seeing things..Krishna was still there. Krishna was standing at the clearing - alone. Why? David didn't know. He held on. He watched. Putting his flute back in it's holder-rope that was tied to his dhoti, Krishna strolled towards the very tree David was hiding in. Did he know ?? David thought. How cud he ? No one did. He hadn't made any sound either. None at all. He was too mesmerized to. David still waited..his heart thumping loudly..his eyes unblinking. Krishna was walking ever so slowly towards his tree. As he reached it, he touched the tree...... the tree felt alive. David was looking from above..not knowing wot would happen next..
What happened next...is only wahtt was completely unimaginable. KRISHNA LOOKED UP....STRAIGHT INTO DAVID'S EYES. Everything inside David stopped. He breathed..but only hardly. He wasn't blinking..not believing. Just staring back. David had become terminally ill the very next day. Somehow, he had hurriedly managed to finish writing the events of the night. As to whether the God of Gods had made a conversation with David, David chose not put that down on paper. No one knows why. He was found dead 2 days later at his home. THE LEGEND OF KRISHNA LIVES ON !!! 22 Spoke their mind: yep, makes a difference !! Keep up the good work...Waiting to know whats the source of ur story...or is it an imagination??? Hm...You are good :P I was almost sure this was goin to be the ending but still you managed to keep up the suspense :). although the Myth stands, what was in Davids report?? Tanvi, Ur rite about Mythology. It's a treasure. I wrote this one though since I had heard about this story quite long nack and I wanted to share it with everyone. Ok, the source of the story is..truely the excerpts written by David himself..told by the pandits all around. Quite interesting read for a weekend. 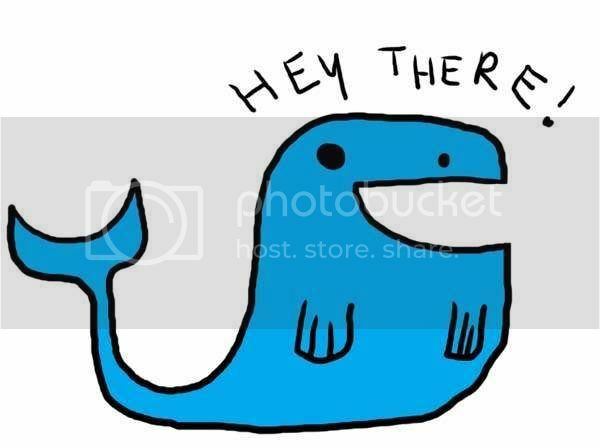 Is it from any specific mythology(source) or fictious?? Today's Writer..It is true..and I believe. I loved writing it. Ill keep minting more. Thanx for ur encouragement. Ammalu..David unfortunately didnt jot down wot he spoke about with the Lord. Wish he had.. Jyotsana...NO..It's over..I guess u didnt click on "Read the rest..."
hey buddy thanks for passing by globalmadarasi blog..cheers..will stay connected..
i like! im confused whether to blv its a fact or a fiction. but i love the way its written n since anything is possible in our world, hell this can be true too! Thanx Ramesh. I liked the blog. Self proclaimed...It actually doen't matter whether it's fact or fiction.. The question is..whether u believe?? If u do..jus like I do..U'll enjoy it...which really matters, doesn't it? Yep, I'll write more.. U got it comin'. Much much thanx ya. Thanx Imp's Mom. I'm all up for the challange for new stuff. U jus watch out now. finally we get to meet krishna....and it left me mermerised. g8 read. but is this a true story???? Yep yep...True as far as I believe it. i jus read the entire story..its amazing n i believe its true... but the only part i din understnad was abt David passing away.. lord wouldn want him to go jus cos he saw him na? Nups, I'm at wits end. I wudn't have a clue on why that happened. Wot the Lord does..why HE does...when HE does.. can any one really tell ?? I'm sure I cudnt. Up to u to conclude. the story was very interesting anand....it kept me gripped all along... there is one story about hanumanji also..a young man clikced a photograph of Him in a jungle where He is sitting and reading something...that man also died soon.now i am going to read other stories here. Glad u liked the story...ur encouragement worked.. Im writing more. OMG.....beautiful story!! I wonder wat wud have been the conversation between Krishnn n David and how long it continued!Keep writing Anand, i enjoyed reading it!